The new king of the playground? Nvidia has unveiled the new silverback gorilla of professional graphics world, its flagship Quadro K6000 GPU. The GPU is based on Nvidia's Kepler architecture and features 12GB GDDR5 graphics memory, along with 2,880 streaming multiprocessor cores. 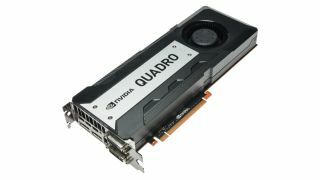 The company is claiming five times higher compute performance and nearly double the graphical grunt of its predecessor, the Nvidia Quadro 6000 GPU. It can support four simultaneous displays up to 4k resolution with DisplayPort 1.2, and provides 'ultra-low latency' video I/O to support large scale visualisations, according to Nvidia. Testimonials have come from Nissan, which is using the extra power to load complete vehicle models into modelling software for almost instant photorealism, while Pixar's artists are using the added memory to render more complex animations in real time. Nvidia has also announced several new mobile workstation GPUs, including the flagship Quadro K5100M, which is also built using the Kelper architecture. It joins other newly unveiled GPUs in the form of the Quadro K4100M, K3100M, K2100M, K1100M, K610M, and K510M. They will be available in the autumn, along with the Quadro K6000, from Nvidia's distribution partners. No word yet on pricing.